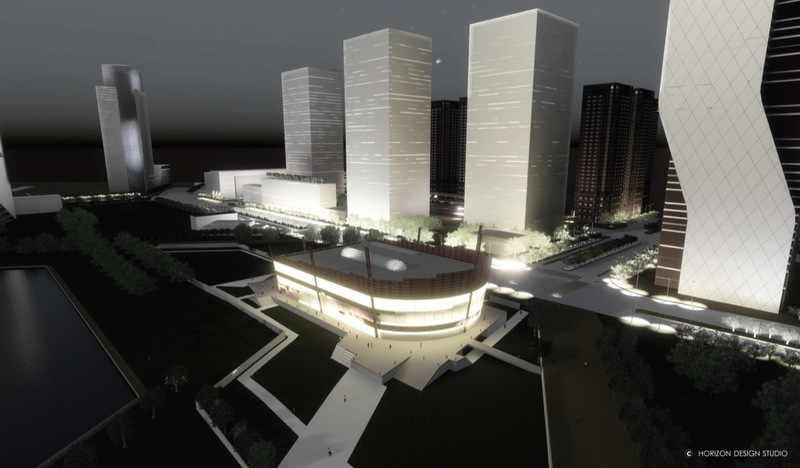 The proposed Museum of World Writing is located at Central park of Songdo International Business District known as ‘ubiquitous city’. 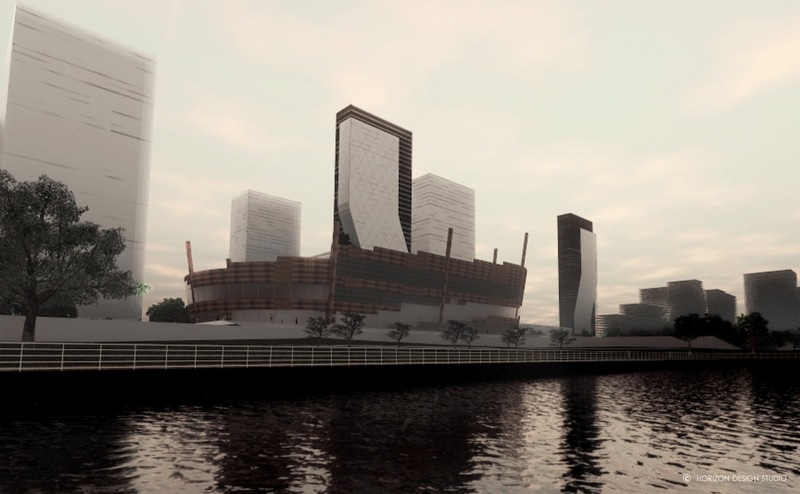 Since this city of 1500 acres is build from the scratch on reclaimed land from Sea, the proposed form respect and consider this aspect as well as the actual site within which the building will sit. 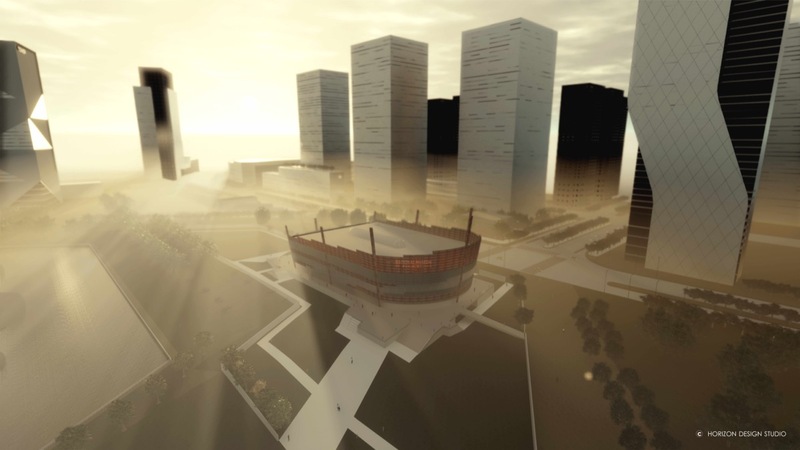 The site is of odd geometry and the proposed building form reciprocates this aspects and harmonize with the built environment at vicinity and the new Songdo City as a whole. The museum is sitting on a podium and heavily influenced by site’s geometry, the waterfront and various access routes to central park. 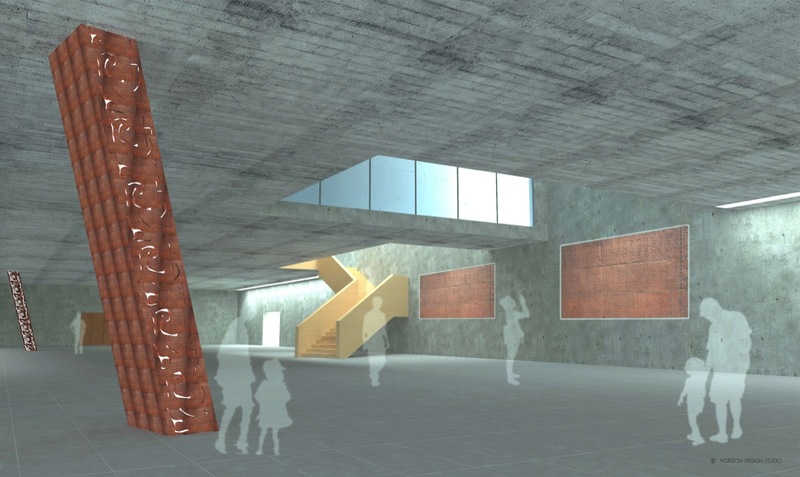 This proposed museum is intended to be belonged to everyone and design incorporates these essential and practical aspects trying to deliver a truly functional museum. A museum is the symbol of regeneration, preservation and continuation and this has been the essence of our proposed design process. The design for the National Museum of World Writing is based on sympathetic approach to the context, nature of site and Songdo city as a whole. The idea is to enhance, create, reinvent the missing or existing key pedestrian link, built mass and other open spaces of the central park and its immediate surrounding and to have a museum building which is welcoming and friendly to public and appropriately embraces site surrounding and context without dominating it. 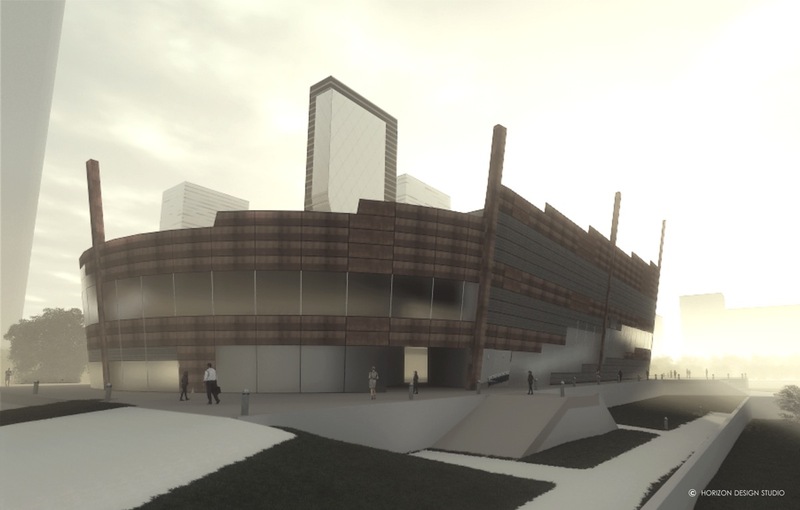 The museum building is sitting on an elevated plinth / podium (consists of basement which is housing the parking, the services, the storage, special exhibition gallery, and a central atrium with cafe) with two entries at this level to improve the connectivity at this level and to the building as whole. The first discovery of metal was Copper followed by bronze and ultimately Iron. The continuity of this period is reflected in design by using the COR-TEN Steel as main exterior cladding material. The facade’s cladding will have ancient language symbols scripted and cut-through on them, similar pattern will be applied to other building material i.e concrete and translucent glass – through which the emitting light in night will exhibit and remind the city of relevance of this invaluable treasure. The building also consists of eight Large columns which are intentionally designed as slightly disproportionate to the form. The idea behind is to represent the ‘known eight direction’ across the globe – of which this museum belongs to. The columns are inclined to have an origin beneath the earth – somewhere below the museum itself – The torch light from them to the sky – will be represent the infinity – a tribute to all the lost and undocumented world scripts – which took centuries to evolve and then lost forever – without a trace. 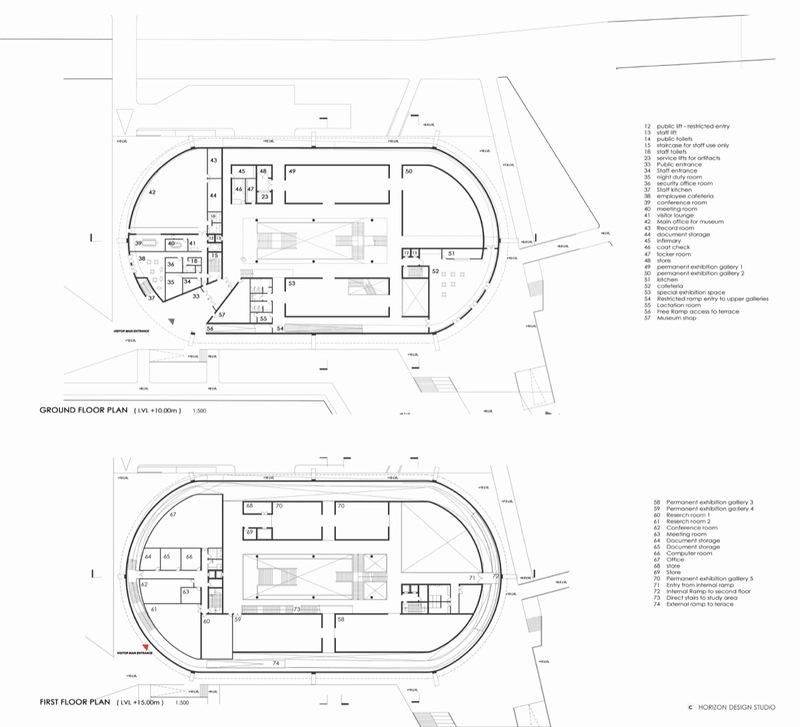 The proposed building layout is simple and symmetrical, the architecture in center is open and raw resulting in a public building which is clean, efficient and visually and functionally legible. The building is non imposing in terms of shape and size – giving freedom to the visitors as how to use it. The museum building by its compact ‘Zero’ inverted shape and variation in height helps to retain the integrity of the central park and surrounding by respecting the open character of park and area around. Main public functions are easily accessed with a clear separation of private and service functional spaces. The absence of any sharp edges provides the continuity on the external skin of building – avoiding essentially any rear or front of the building . The museum makes best use of its ellipse shape with continuous ring of translucent glass & clear glass – which in day time create an atmosphere of transparency and of welcoming feeling and at night the multi-layer facade of translucent and clear glass diffuse and reflects the internal light making the museum as a lamp / lantern of the central park. 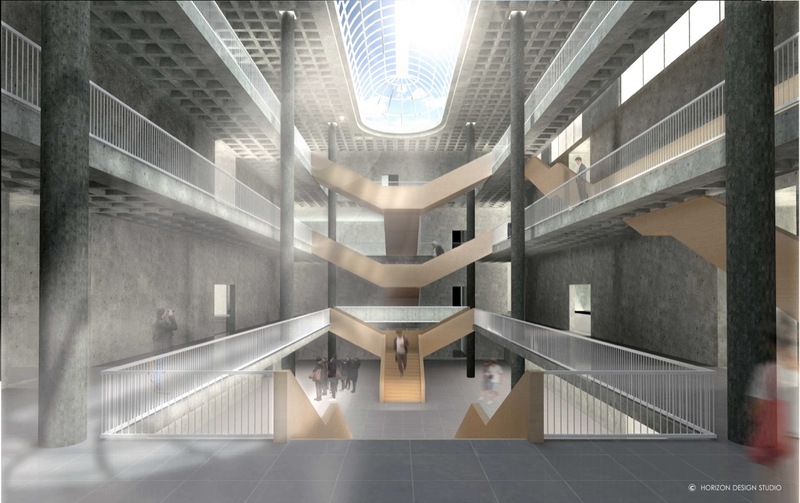 The corridors and the projected balconies around the central atrium will encourages people to flow within this public building uninterruptedly. The delicately assembled fragmented volumes will create logical passages in between, which will allow the visitors to break from long corridors and also offers the flexibility about use of space. The proposed design promotes openness and boost public engagement. Visitors will be able to enjoy and appreciate the exhibits and the building itself while walking through these simple magnificent but generous corridors. The distinctive yet elegantly ‘sculptured -like’ appearance sitting majestically on podium provides a charismatic addition to the park and city skyline. Clearly visible by its distinctive yet fitting shape and size in cluster of akin high rise buildings. The museum building taking advantage of spectacular setting of park and waterfront will leave a remarkable imprint on the visitors arriving either by land , sea (part) or air (airport). The proposed ‘National Museum of World Writing’ will ultimately be a unique, conveniently accessible and a very public building. It will be effectively a new addition to destinations of Songdo city along with waterfront and Central park. This monumental yet elegant and imposing building will not only be an addition to Incheon but a tribute to the “all known and undiscovered, documented and unrecorded, prevailing and forgotten’ World Scripts. This timeless and priceless treasured collection of humanity which continuously and constantly evolved from ‘Stone-Age’ through Iron-age to present 21st Century needs equally commensurate building – if not less. The proposed building is designed to meet most of these aspects and design requirements – if not all.